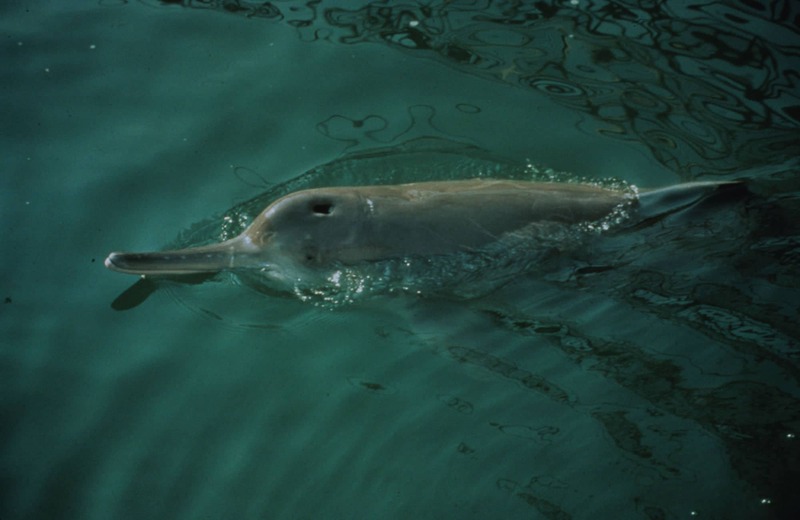 The Chinese river dolphin, or baiji, holds the unenviable record of being the first dolphin species driven to extinction by human beings. The mighty Yangtze River in China was the baiji’s home for 20 million years. It took less than 50 years for humans to wipe them out Baiji numbers crashed dramatically and then they disappeared entirely from the river. They were pronounced extinct in 2007 following the failure of a dedicated 6-week expedition in 2006 to find a single one. There have been no confirmed baiji sightings since before 2006. What did baijis look like? The baiji has a stocky body with broad, rounded flippers. The head is small with a prominent melon, a very long, narrow beak which is slightly upturned at the tip and a long mouth line. The baiji’s eyes are tiny and positioned higher up on the head than in other species of dolphin. The dorsal fin is small and triangular with a wide base and is located more than halfway back. Baijis are generally bluish grey colour on their back and greyish white on the lower part of the body. What was life like for a baiji? Baijis lived in small groups of two to six; the largest group recorded was 16 baijis. They were not demonstrative dolphins and usually surfaced without much disturbance. They were quiet and shy and difficult to approach since they would actively avoid boats. Baijis primarily relied on echolocation to find their way around and hunt freshwater fish in the river and connecting lakes. The baiji’s eyesight was poor and anyway not particularly useful because visibility in the water often wasn’t good. Unfortunately the baiji’s ability to communicate, navigate, avoid danger and find food using echolocation became increasingly challenging as the river became a noisy place to live. Human exploitation and development of the Yangtze River rapidly escalated and the associated noise pollution increased rapidly as hundreds of boats using the river quickly became thousands of noisy ships using it as an aquatic highway. Life must have been very difficult for the surviving baijis and then the final nail in the baiji’s coffin came in the form of the Chinese approval of the Three-Gorges Dam construction. The building of this mega hydroelectric dam of mind-boggling proportions began in 1994 and construction took several years; it caused huge-scale environmental damage to the Yangtze River, destroyed wildlife habitats and wiped out native species. A live caught female baiji was found to be 24 years old. This was therefore minimum life expectancy estimate for wild baijis. The age of sexual maturity for male baijis was about 4 years old and for females was about 6 years old. Baiji pregnancies lasted for 10–11 months. Baiji gave birth to a single baby every few years. Baijis ate a wide variety of freshwater fish, including both surface and bottom feeders. The baiji was a freshwater dolphin that lived only in the Yangtze River in China. The Yangtze is the third longest and largest river in the world and the biggest river in Asia. Baijis lived largely in the mainstream of the middle and lower reaches of the Yangtze River and two large connecting lakes - Dongting and Poyang. Baijis were usually seen close to sandbars which are created where tributaries enter the main river and sediments are deposited. These sandbars create eddies in the water which are nutrient-rich and attract fish. Baijis (and fishermen alike) favour these habitats to catch fish. The baiji is the only member of the mammal family called Lipotidae. 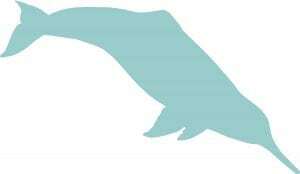 This is because the baiji has unique features which are not shared with any other whale or dolphin species. Part of the baiji’s skeleton and stomach anatomy are unique (the stomach is divided into three compartments). The extinction of the baiji also marks the extinction of the entire ancient Lipotidae family the baiji represented. The Lipotidae separated from the other river dolphins during the evolutionary process about 20 million years ago. The Yangtze River Basin in China is home to about 12% of the world’s human population. Rapid economic development of the Yangtze River Basin caused extensive habitat degradation. The baiji faced a range of threats from human activities, especially bycatch and habitat destruction. A lethal combination of threats killed far more baijis each year than were being born, and caused an extraordinarily fast decline in baiji numbers. Before 1950, there were an estimated 6000 baijis, by the 1980s only 300 survived. In 1997, there were only an estimated 13 left, and the baiji was the most critically endangered dolphin in the world. In 2007 scientists declared the baiji extinct when they had failed to find evidence of a single one in the Yangtze River during an extensive search. Drastic declines in the Yangtze River’s fish populations occurred due to overfishing which reduced the amount of prey available for the baiji. Baijis were accidentally caught and killed by many different fishing methods used in the river. They were frequently snagged and trapped on hooks attached to longlines placed on the riverbed; entangled in gillnets; and killed by electric shocks used in electrofishing. During the 1970s and 1980s, between 50% and 60% of dead baijis had hook marks on them and hook remains were found in the stomachs of dead baijis. Unfortunately, although regulations were made banning harmful fishing practices, they were not adequately enforced and illegal, harmful fishing continued to kill baijis. The amount of habitat suitable for baijis was greatly reduced due to industrial scale dam construction and port development along the length of the river. Dam construction interrupted the river’s natural flow, reduced fish abundance, and prevented free movement of baijis in the river. Construction of the first dam across the mainstream of the Yangtze River - the Gezhouba Dam - began in 1970. Baijis living in the river upstream of the Gezhouba Dam were isolated there. Below the dam, river habitats were destroyed including the sandbanks favoured by baijis. The construction of the Three Gorges Dam began in 1994; this colossal development on the Yangtze River caused huge scale environmental damage and was the final nail in the coffin for the baiji. Increasing numbers of boats and ships using the river resulted in more baijis being injured and killed by collisions. 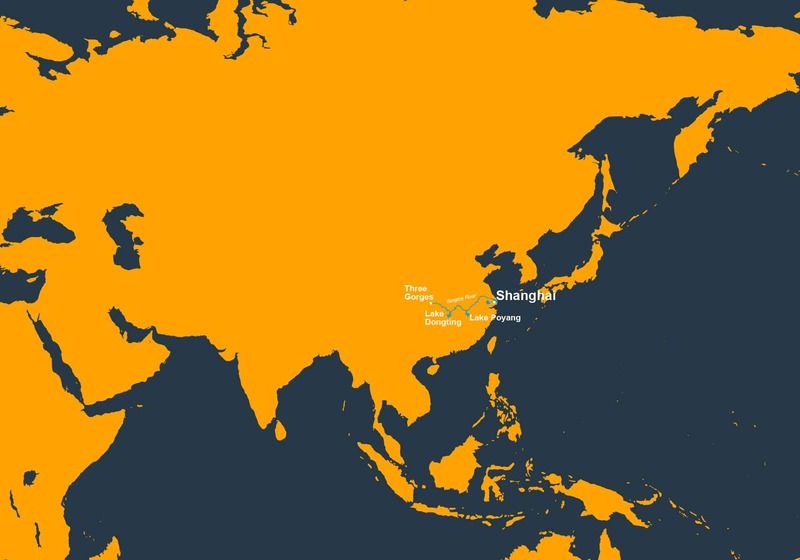 By 1992 there were 221 ports along the Yangtze River. In 2006, members of the baiji expedition team counted 19,830 large shipping vessels and 1175 fishing vessels in the survey area between Yichang and Shanghai. The remaining river dolphins are all under threat from human activities. Pollution – toxic chemicals from plastics, litter and oil spills build up in orcas, seriously harming their health and their ability to have young. Fishing gear – orcas get accidentally caught in fishing nets and lines, injuring or even killing them. Habitat loss - As human activities increase along rivers, there are fewer clean and safe places for river dolphins to live.